I have met many generous, kind, talented people in my life. Today I want to mention one whom I've only "met" over this blog. Diane has been popping in over here for quite a long time and I have always enjoyed reading her blog. Especially the posts about quilt-making, because although I have never pieced anything quilt-like together and certainly haven't quilted anything, I've always loved quilts and wanted to learn to quilt some day. Back in January, she showed off a lovely quilt that didn't meet her standards of perfection. Some marking pen didn't come out and naturally she wasn't happy about that. I thought it was still beautiful and she offered to send it to me. So here we are post-England and back at home and guess what came in the mail the other day! Gorgeous! A special gift for a fifth baby (as I mentioned to her, having something special for a baby that far down the family line is really extra nifty, because let's face it, most of the outside world is a little bored by Adams' babies by now). Since I don't really know what I'm looking for, I can't even find the markings that were such a problem, but even if I could, the quilt is very beautiful. It may really belong to Bambino #5, but that doesn't mean that it has been wrapped around several children in the last few days and given warmth to more than one doll. Diane told me it was a blanket meant to be used and I can state for a fact that it certainly will be. 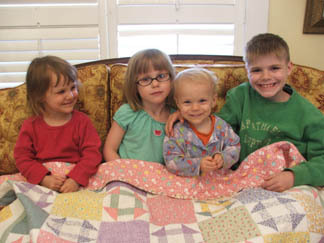 It is a beautiful quilt, and such a sweet photo!!! This and the camp-out post just make me say, "Awww!!!" Such a sweet family. Daniel got a blanket from one of my co-workers, which was a real treat too. It's a nice fuzzy soft one.